On Sept 3, the Rams were back in action as they faced Bentley University. 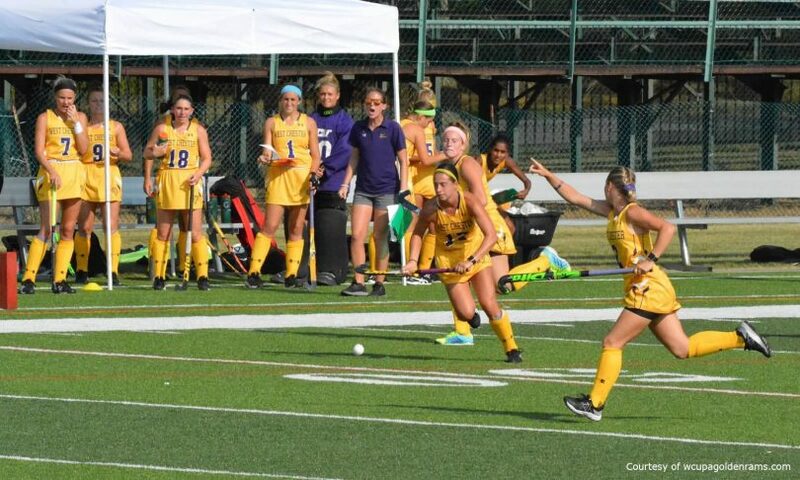 West Chester scored very early with a goal from Kelsey Munster. Munster scored off an assist from teammate Katie Thompson to score in the fifth minute. This would be Munster’s first goal of the season. Not long after, Munster scored her second goal of the game, and season, in the seventh minute. Kaitlin Hatch assisted the goal. The Rams offense was quiet until Lily Feldman’s goal with 15 minutes left in the half. This goal was Thompson’s second assist of the game. Thompson scored a goal of her own before the end of the half, and the Rams went into the locker room with a 4-0 lead over Bentley University. The Rams had 10 shots on goal with 13 shots total. Their opponents, the Falcons, had one shot on goal with two total shots. In the 39th minute Emma Velez had her first collegiate goal to give the Rams a 5-0 advantage. The Falcons were able to get on the board in the 45th minute. Marree Corver had her first goal of the season off another assist from Thompson. Both Dara Spavlik and Devon Godek had their own goals leaving the Rams with a 8-3 win over the Falcons. Thompson lead the team in assists with three and Munster lead the team in goals with two. The Rams traveled to Indiana University of Pennsylvania for their next match on Sept 15. West Chester shut out IUP with a 7-0 victory. Velez lead the team in scoring with a hat trick. Caitlin Kelley wasn’t too far behind with two goals of her own. Thompson and Emily Evans both scored against IUP. The Rams outshot IUP 28-2 in the match. Their next game was against No.5 Millersville. It was a close match between the Rams and Marauders. Luckily for the Rams, they were able to pull out their first victory against Millersville since 2015. Hatch had the two goals for the Rams including one penalty stroke in the 59th minute. The Rams had six shots on goal eight total in the match. The Rams then returned home for their home opener against Slippery Rock on Sept. 22. The Rams added another shutout to their season with a 4-0 victory over Slippery Rock. Slippery Rock had zero shots with 16 saves. The Rams had 31 shots total with 20 on goal and the four goals of the game coming from Thompson, Hatch, Caitie McNamara, and Sophie Ruppert. Thompson struck first with her goal in the 25th minute off an assist from McNamara. McNamara had her own goal in the 42nd minute off an assist from Feldman. Ruppert added to the lead in the 54th minute. Last, Hatch scored in the 65th minute off a penalty score to send the Rams off with a 4-0 victory. The Rams also held the advantage with 15-0 corners. The 4-1 Rams are back on the road as they travel to East Stroudsburg University this Tuesday evening for a 4 p.m. start. Jordan Zimmerman is a second-year student with an undeclared major. ✉ JZ885480@wcupa.edu.